Satoru Iwata (Japanese: 岩田 聡, Hepburn: Iwata Satoru, December 6, 1959 – July 11, 2015) was a Japanese video game programmer and businessman who was the fourth president and chief executive officer (CEO) of Nintendo. He is widely regarded as instrumental in broadening the appeal of video games to a wider audience by focusing on novel and entertaining games rather than top-of-the-line hardware. Born in Sapporo, Japan, Iwata expressed interest in video games from an early age and created his first simple game while in high school. He majored in computer science at the Tokyo Institute of Technology. In 1980, he joined the game developer HAL Laboratory while attending the university. During his early years at HAL Laboratory he worked as a programmer and closely collaborated with Nintendo, producing his first commercial game in 1983. Notable titles to which he contributed at HAL include EarthBound and the Kirby series. Following a downturn and near-bankruptcy, Iwata became the president of HAL Laboratory in 1993 at the insistence of Nintendo President Hiroshi Yamauchi and brought financial stability to the company. In the following years, he assisted in the development of the Pokémon and Super Smash Bros. series. Iwata joined Nintendo as the head of its corporate-planning division in 2000. Nintendo soon saw notable growth with Iwata's assistance and, when Yamauchi retired, he became the company's president in May 2002. Under Iwata's direction, Nintendo developed the Nintendo DS and Wii video game consoles, helping the company achieve financial success. As a self-declared gamer, he focused on expanding the appeal of video games across all demographics through a "blue ocean" business strategy. The company attained record profits by 2009, and Barron's placed Iwata among the top 30 CEOs worldwide. Iwata subsequently expanded his blue ocean strategy by defining a quality of life product line for the Wii that later evolved into a ten-year business strategy to create stand-alone products. Later hardware such as the Nintendo 3DS and Wii U proved far less profitable than the Wii, and Nintendo's net sales fell by two thirds from 2009 to 2012; the company saw its first operating losses in 30 years during this time. Iwata voluntarily halved his salary in 2011 and 2014. In 2015, after several years of refusal, Iwata put a portion of Nintendo's focus into the rapidly growing mobile game market; a landmark partnership with mobile provider DeNA was established that March. Throughout his career, Iwata built a strong relationship with Nintendo fans through social media and his regular appearances in Iwata Asks and Nintendo Direct, becoming the public face of the company. In June 2014, a tumor in Iwata's bile duct was discovered during a routine physical exam. It was removed, and Iwata returned to work in October of that year. The problem resurfaced in 2015, and Iwata died at the age of 55 from its complications on July 11. Members of the gaming industry and fans alike offered tributes through public announcements and social media, and fans worldwide established temporary memorials. Iwata was posthumously awarded the Lifetime Achievement Award at the 2015 Golden Joystick Awards and the 2016 DICE Awards. A Commodore PET 2001, the same model series Iwata purchased in 1978 and subsequently dismantled. Satoru Iwata was born on December 6, 1959, and raised in Sapporo, Japan, where his father served as a prefectural official. Throughout middle and high school, Iwata displayed leadership skills through service as class president, student council president, and club president at various times. His first experience with computers was in middle school with a demo computer that used telephone lines. Iwata would frequent the Sapporo subway and play a simple numeric game, called Game 31, until he mastered it. With money saved up from a dish-washing job and some additional allowance from his father, Iwata purchased an HP-65, the first programmable calculator, in 1974. After entering Hokkaido Sapporo South High School in April 1975, he began developing his own games during his junior year. The several simple number games Iwata produced, such as Volleyball and Missile Attack, made use of an electronic calculator he shared with his schoolmates. 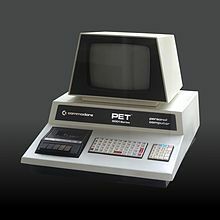 Iwata obtained his first computer, a Commodore PET, in 1978. He dismantled and studied the machine out of his desire to understand it. The computer coincidentally had a central processing unit (MOS 6502) similar to the one used by Nintendo for the Nintendo Entertainment System (NES), a gaming console for which he would later develop games. Following high school, Iwata was admitted to the Tokyo Institute of Technology in April 1978, where he majored in computer science. Tomohiko Uematsu, an engineering professor, noted Iwata's proficiency with software programming and remarked that Iwata could write programs faster and more accurately than any of his other students. While attending the school, he was one of several unpaid interns at Commodore Japan, assisting the subsidiary's head engineer—Yash Terakura—with technical and software-development tasks. One of his main reasons for taking the job was to spend more time around computers and learn of details not openly available to the public. Terakura would later serve as a mentor to Iwata, teaching him about hardware engineering to supplement Iwata's already extensive software knowledge. Iwata and several of his friends rented an apartment in Akihabara and soon formed a club where they would create and code games. Classmates living in nearby apartments referred to Iwata's room as "Game Center Iwata". [nb 1] He would frequently show off his games to the Seibu department store's computer department, and by 1980 a group of employees there invited him to join their company, HAL Laboratory, Inc. While attending university, Iwata worked for HAL Laboratory as a part-time programmer in 1980. Among their first creations was a peripheral device that enabled older computers to display graphics for video games. With this device, Iwata and members of HAL created multiple games that were "straight rip-offs of Namco’s Rally-X, Galaxian, and others". Despite this, HAL became the first company to establish a license with Namco for developing games. He joined the company in a full-time capacity after graduating in 1982, becoming its fifth employee and only programmer. Around the same time, Iwata's father was elected mayor of Muroran. Despite his passion, Iwata's family did not approve of his career choice, and his father did not talk with him for six months after Iwata joined HAL. Iwata became the company's coordinator of software production in 1983, the time during which he helped HAL create a relationship with Nintendo so they would be able to produce games for its newly released Nintendo Entertainment System. He traveled to Kyoto himself to request permission to work on games for the NES, to which Nintendo obliged. His first commercially published game was Joust for the NES—a port of the 1982 arcade game. Other video games he worked on were Balloon Fight, NES Open Tournament Golf, EarthBound, and the Kirby games. Nintendo initially contacted several other developers to produce Open Tournament Golf; however, all of them declined as they did not believe the large amount of data could be stored within an NES cartridge. Iwata seized this opportunity and "recklessly" stepped up to develop the game. It proved particularly taxing as Iwata had to create his own data compression method in order to fit all 18 courses into the game. Similarly, HAL had to program parallax scrolling for F-1 Race as the NES hardware did not initially support it. Iwata's proficiency with programming quickly placed him in high esteem among fellow programmers and gamers alike. He would often continue to work on weekends and holidays because of his passion. With the company on the verge of bankruptcy, Iwata was promoted to president of HAL in 1993 at the insistence of Nintendo's then-President, Hiroshi Yamauchi. With assistance from Nintendo, Iwata helped turn the company around from its ¥1.5 billion debt and stabilize its finances within six years. Lacking experience in management, Iwata put a lot of effort into learning how to better himself, often reading books on the topic and seeking advice from others. Although he was not part of Nintendo at the time, Iwata assisted in the development of Pokémon Gold and Silver, which were released for the Game Boy Color in November 1999, by creating a set of compression tools utilized for graphics in the games. While working as a go-between for Game Freak and Nintendo, he aided in the programming of Pokémon Stadium for the Nintendo 64 by reading the original coding in Pokémon Red and Green and porting the battle system into the new game in just one week. According to Tsunekazu Ishihara, the president of The Pokémon Company, Iwata was instrumental in bringing Pokémon to Western markets. While being president of HAL, he developed the plan for localization after reviewing the code for Red and Green, which was then completed by Teruki Murakawa, with the Western releases coming two years after their Japanese release. Additionally, he assisted Masahiro Sakurai in the development of Super Smash Bros. for the Nintendo 64. In 2000, Iwata took a position at Nintendo as the head of its corporate planning division and took a seat on the board of directors. Over the next two years, he sought to reduce the cost and length of game development while preserving quality. During his first two years at Nintendo, the company saw profit increases of 20 and 41 percent, values which are at least partially attributable to his work. When Yamauchi, the company's president since 1949, retired on May 24, 2002, Iwata succeeded as Nintendo's fourth president with Yamauchi's blessing. He was the first Nintendo president unrelated to the Yamauchi family through blood or marriage since its founding in 1889. Yamauchi left the company in Iwata's hands with a final request: "that Nintendo give birth to wholly new ideas and create hardware which reflects that ideal. And make software that adheres to that same standard." Iwata inherited a company that promoted individualism, with a policy established by Yamauchi to create new development positions as needed. However, this inhibited efficient collaboration between certain departments. At the time of Iwata's promotion, Nintendo, though still a profitable company, was not performing as well as other console makers. The recently released GameCube was performing poorly compared to competitors, with Sony's PlayStation 2 and Microsoft's Xbox outselling it. His presidency also came at the onset of the popularization of online gaming, and Nintendo had yet to move into this facet of the market. He took a cautious approach to the issue, stating: "We're not negative toward the idea of going online. We're just practical." He also fostered a relationship between Nintendo and Capcom that improved the GameCube's appeal. During an interview in 2002, Iwata stated that he felt the gaming industry was becoming too exclusive, and he wanted to develop hardware and games that would appeal to all players rather than focusing on top of the line graphics. One of his first actions as president was to meet directly with the company's 40 department heads and 150 other employees. This contrasted starkly with Yamauchi's practice of rarely meeting with employees and generally having a single, annual speech. Shigeru Miyamoto described the previous business atmosphere as "stuffy" and stated Iwata "improved the ventilation". Iwata was acutely aware that his position as president would not ensure compliance from his employees and sought to communicate with them on a personal level. If employees disagreed with his view, Iwata would suggest they follow their idea instead of his own, stating "creators only improve themselves by taking risks". Alongside the increased level of interaction, Iwata also brought more data and science into the business aspect of the company. Whereas Yamauchi made decisions based on intuition and experience, Iwata brought forth hypotheses loaded with data to convey his position. Iwata also promoted Miyamoto, Genyo Takeda, Yoshihiro Mori, and Shinji Hatano to representative directors on the company's board of directors, equaling his own position. Iwata directed Nintendo to produce the Nintendo DS (left) and Wii (right) units, which proved financially successful for the company. Following up on his 2002 interview, Iwata highlighted an urgency in the gaming market in his keynote speech at the 2003 Tokyo Game Show. During this speech, he reflected on the history of the industry and concluded with the declining interest in video games. A slump in sales in the Japanese market had begun at the end of the 1990s and continued into the early 2000s. Competition between Nintendo and Sony resulted in increasingly hardware-heavy consoles; however, the Nintendo 64 proved to be too cumbersome for developers and software suffered severely. After a year-long analysis conducted at Iwata's behest, Nintendo concluded that pushing hardware was not the most effective way to promote video games and decided to focus on software. A major internal reorganization of Nintendo took place in 2004, with Iwata consolidating various departments established under Yamauchi. He sought to promote collaborative work throughout the company. He later established a "User Expansion Project" in 2005 whereby employees normally not associated with game development would submit ideas for new games. In a March 2004 interview, Iwata stated: "Games have come to a dead end." He stressed that developers wasted far too much time focusing on core gamers and would be unable to turn a profit if they did not tend to the average game player. Furthermore, he wished to prove that Nintendo, considered a "conservative" company at the time, would become a forefront innovator of entertainment. Iwata articulated a "blue ocean" strategy to help Nintendo successfully compete against the other console manufacturers. Instead of competing on technical specifications, Iwata drew on his previous experience as a game developer to produce novel and entertaining hardware and games. Iwata helped lead a revitalization of Nintendo's handheld business by transitioning the company from the Game Boy Advance to the Nintendo DS, which sported a unique form factor and inclusion of a touchscreen that allowed for novel games. The idea for using two screens on a single device originated with Yamauchi before his retirement, while Miyamoto suggested the use of a touchscreen. Miyamoto subsequently spearheaded development of the device and its prototypes. The Nintendo DS proved to be a highly profitable system and went on to become the second-best selling video game console of all time with more than 154 million units, inclusive of subsequent iterations, sold by September 2014. In June 2004, Iwata sought a conference with Dr. Ryuta Kawashima about a game that could appeal to non-gamers. This project would later become Brain Age: Train Your Brain in Minutes a Day!, released in May 2005. Iwata personally oversaw development of the Brain Age series, even foregoing a public appearance on the day of the Nintendo DS's release in Japan on December 2. Miyamoto supported Iwata's work with the series and sent one of his protégés, Kouichi Kawamoto, to help develop the game. The Brain Age series is partially credited with launching the popularity of the Nintendo DS, and the series as a whole sold over 30 million copies by December 2008. Subsequent iterations of the Nintendo DS, the DS Lite and DSi, also saw positive sales. The DS Lite improved upon the original DS, featuring brighter screens and a slimmer design in accordance with consumer demand. Released in March 2006 in Japan and three months later worldwide, the DS Lite ultimately sold nearly 94 million units. Statistics showed that households often shared a single DS, and Iwata sought to expand this from one per household to one per person. The console's third iteration, the DSi, embodies this idea with the "i" representing a single person. Despite concerns that the video game market was already over saturated by the DS and DS Lite, Iwata was confident that the DSi would sell, especially in European markets. The DSi built upon the success of the DS Lite by similarly meeting consumer demand. In addition to being slimmed further, the DSi featured two cameras, SD card support, an audio reader, and the "Nintendo DSi Shop". The relatively quick succession of the DS Lite and DSi broke the conventional pattern for release of game systems, each being released roughly 18 months apart instead of 5 years. Iwata saw the gradual price drop in the five-year cycle as a way of indirectly telling consumers to wait to purchase products and a punishment for those who bought it at launch. He sought to alleviate this issue with the quick releases. Discussions between Iwata, Miyamoto, and Takeda about a new home console began in the first half of 2003. With encouragement from Yamauchi, Iwata pushed for development of a revolutionary product that would later become the Nintendo Wii. Iwata subsequently assigned Takeda to the project, "telling [Takeda] to go off the tech roadmap". The overall premise was that "a Mom has to like it". During the console's development process Iwata challenged engineers to make the Wii no thicker than three DVD cases stacked together, a feat they ultimately accomplished. Takeda and his team focused on reducing power consumption while retaining or improving levels of performance shown with the GameCube. Alongside the internal hardware designed by Nintendo's engineers, Iwata proposed that the console abandon use of a typical controller to make gaming more accessible to everyone. Miyamoto took the lead on developing a new controller while Takeda's team provided the internal components. After six months and dozens of scrapped prototypes, Takeda procured a CMOS sensor that later became the core aspect of the remote. With the addition of accelerometers, they were able to effectively produce motion controls. Initially codenamed "Revolution" during a teaser at E3 2004, following Iwata's goal of creating a gaming revolution, Iwata publicly revealed the Wii at E3 2005, holding it above his head to emphasize its small size and light weight design. Reveal of the Wii's signature Wii Remote controller was withheld until the Tokyo Game Show in September 2005. During his speech at the conference, Iwata reiterated his stance on growing the gaming market but expanded upon it by emphasizing the need to make controls less complicated. The controller's remote control design partially stemmed from Iwata's desire to have a device that was "immediately accessible" to all. He also insisted that the Wii Remote be referred to as simply a "remote" rather than a controller to emphasize its accessibility to anyone. The Wii ultimately popularized the use of motion control-based video games and proved highly successful for Nintendo, helping to nearly double the company's stock price. Tapping into the market of casual players, the Wii marked "a breakthrough moment in the history of video games": a new genre of gaming was established for the family market. Iwata's former experience as a programmer, a rarity for technology CEOs, was said to help contribute towards his leadership of the company. By the end of the 2009 fiscal year, Nintendo saw record net sales and profit of ¥1.8 trillion (US$18.7 billion) and ¥279 billion (US$2.8 billion), respectively. Due to his success, Barron's included Iwata on their list of the 30 top CEOs worldwide from 2007 to 2009. 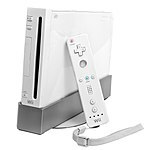 Starting with the introduction of the Wii in 2006, Iwata placed focus on development of products that improved quality of life. The Wii Fit series, conceptualized by Miyamoto, epitomized this movement. At E3 2009, Iwata revealed development of an add-on product to the Wii: the Wii Vitality Sensor. The device measured autonomic nerve functions, namely pulse, and incorporate acquired data into relaxation products. Iwata saw the device as a continuation of the "blue ocean" strategy previously articulated. He indicated that the market of motion controls was turning into a "red ocean", whereby too many companies would saturate the market and restrict profits. The Vitality Sensor was developed in hopes of providing a novel way to interact with video games and continue Nintendo's history of innovation. However, testing of a prototype device yielded less than desirable results and Nintendo had postponed the release of the product indefinitely by 2013. In January 2014, Iwata unveiled a ten-year strategy for the company based on quality-of-life products. The target was a new market outside video games. Developed under partnerships with Dr. Yasuyoshi Watanabe and ResMed, the first device in this initiative was a fatigue and sleep deprivation sensor announced in October 2014. Unlike the Vitality Sensor, the sleep sensor was to be a stand-alone product that would not need to be worn. Following Iwata's death in July 2015, analysts questioned whether Nintendo would continue the quality-of-life initiative. Despite a planned United States release in March 2016, some suggested the product had been temporarily shelved, while others believed the product had been indefinitely postponed like the Vitality Sensor before it. The device was formally discontinued by February 2016; however, Tatsumi Kimishima stated that research into quality of life products would continue. Note: Green indicates an operating income while black indicates an operating loss. Subsequent hardware units under Iwata's tenure, including the Nintendo 3DS and Wii U, were not as successful as the DS and Wii, and Nintendo's finances took a downward turn starting in 2010. During the development phase of the 3DS, a handheld device featuring stereoscopic 3D without the need of accessories, Iwata stated that his background in technology helped keep Nintendo's engineers in line. It was hoped that the successor to the Nintendo DS would reinvigorate the company after profits began declining. However, weak sales upon the release of the Nintendo 3DS caused the company's stock to fall by 12 percent on July 29, 2011. The console's poor sales prompted a price cut in August from its launch price of US$250 to US$170. Sales of the 3DS continually fell below expectations. Iwata later admitted in 2014 that he had misread the market and had not appropriately accounted for changing lifestyles since the launch of the Wii. He continually placed focus on family-oriented games despite declining popularity. The Wii U, released in November 2012, was sold below its production cost as Nintendo hoped for stronger software sales to alleviate ongoing losses. The addition of HD graphics, a feature not present in the original Wii, placed unexpected strain on development teams and led to software delays. Compounding the frustration of consumers was Iwata's disinterest in competitors such as Microsoft and Sony, both of which experienced similar issues during the releases of the Xbox 360 and PlayStation 3 respectively. Paul Tassi of Forbes claimed that Nintendo could have handled the change more efficiently by drawing lessons from Microsoft and Sony's transition to HD graphics. The console ultimately failed to meet sales expectations and became the slowest-selling Nintendo platform, with 9.5 million units sold by June 2015. Miyamoto attributed the lackluster sales to public misunderstandings of the console's concept and functionality. Iwata later admitted the console to be a failure as a successor to the Wii, with games being unable to showcase notable originality in the Wii U. The back-to-back failures of the 3DS and Wii U prompted Mitsushige Akino of Ichiyoshi Asset Management Co. to suggest that Iwata should resign from his position. Nintendo's overall net sales declined from its peak of ¥1.8 trillion (US$18.7 billion) in 2009 to ¥549 billion (US$4.6 billion) in 2015. Net income losses were incurred in 2012 and 2014. In 2010, Nintendo revealed that Iwata earned a modest salary of ¥68 million (US$770,000), which increased to ¥187 million (US$2.11 million) with performance based bonuses. In comparison, Miyamoto earned a salary of ¥100 million (US$1.13 million). Iwata voluntarily halved his salary in 2011 and 2014 as apologies for the poor sales while other members of the Nintendo board of directors had pay cuts of 20–30 percent. This also served to ensure the job security of Nintendo's employees, preventing workers from being laid off in order to improve short-term finances. In 2012, the company experienced its first operating loss since entering the video game market more than 30 years earlier. Losses continued for the next two years before the company finally returned to profitability at the end of the 2015 fiscal year. The slight turnaround was largely attributed to blockbuster games such as Pokémon Omega Ruby and Alpha Sapphire and Super Smash Bros. for Nintendo 3DS and Wii U. In June 2013, Iwata took on the additional role of Nintendo of America's CEO. As one of his first changes as CEO, Iwata decided that they would not hold large press conferences at E3, and instead have several smaller events, each aimed at a certain demographic. While traveling to Tokyo in late 2013, Iwata sketched an idea for a series of physical toys that could connect with Nintendo's games. This concept soon developed into the Amiibo line of figures which launched less than a year later. Amiibo proved to be a huge success, with more than 6 million figurines sold by the end of 2014, roughly a month after launch. By March 2016, combined sales of figures and cards—a product released in 2015—exceeded 64 million units, proving financially beneficial across all Nintendo platforms. In early 2010, the success of Apple Inc.'s mobile App Store prompted concern among game developers that the medium was shifting to smart devices. That July, Iwata acknowledged competition from Apple and considered them the "enemy of the future". However, during an interview the following year, Iwata appeared entirely against the idea of Nintendo moving into the mobile market, claiming the company would "cease to be Nintendo" if they did so. He reasoned that mobile gaming would lack integrity over the quality of games in an effort to turn a profit. A slow shift in this view ensued over the following years as the mobile gaming market continued to grow. In 2012 he acknowledged that mobile devices provided significant competition but remained confident in his company's abilities. In a message to shareholders in March 2014 fiscal year, Iwata stated, "… I believe that the era has ended when people play all kinds of games only on dedicated gaming systems." He cited the convenience of mobile devices for quick entertainment and expansive capabilities over a handheld console's dedicated software. Criticism arose over his continued stubbornness in moving to the mobile market, with analysts and investors continually requesting a change in outlook. Yoshihisa Toyosaki, president of Architect Grand Design Inc., claimed that "Nintendo is out of touch", referring to the company's history of ignoring outside input. This ultimately negatively influenced Nintendo's finances and popularity to a degree. In March 2015, Iwata put part of Nintendo's focus on the growing mobile game market, creating a landmark partnership with mobile provider DeNA to publish titles, as traditional hardware console sales began to falter. This came in stark contrast to the company's previous business model which put focus on console exclusive titles to prompt people to buy their platforms. Iwata emphasized that although Nintendo IPs would be utilized in mobile games, the company would not compromise their integrity. He also stressed that the main goal would be to reach as many people as possible rather than which options would earn the most money, similar to the idea behind the Wii. After the partnership with DeNA was established, Iwata reiterated his stance that the common free-to-play type mobile games, which he referred to as "free-to-start", threatened the future quality of games. Although he acknowledged the practice as a viable means of promoting titles in the short-term, he considered the model outdated and not a sound direction for core development. He also emphasized that the business model for these games did not match with the core values of Nintendo and could not serve as the basis of "long-lasting relationship with [Nintendo's] customers". Iwata oversaw development of the Nintendo Switch through the final months of his life, serving as the console's head developer. In a February 2017 interview with the magazine Time, Miyamoto believed Iwata's goal for the system was to make it portable and allow communication between people. Iwata focused on the technical aspects of the device during this stage. Iwata was well known for incorporating his humour into his Nintendo Direct videos, such as during a pre-recorded video shown at E3 2012 when he stared at bananas in silence for several seconds before turning to the camera. During the earlier years of his presidency at Nintendo, Iwata would often forego media appearances, unless new hardware was being announced, in order to spend more time programming. However, his attitude towards this changed, and he eventually became a prominent part of Nintendo's public relations. Iwata helped Nintendo to improve relations with its fans by regularly responding to them through social media, and he shared insights on Nintendo's employees, games, and hardware through his interview series Iwata Asks. Inspiration for this series, which began in September 2006, stemmed from Iwata's background as a game programmer and his curiosity of the mindset of other developers. These interviews often showcased the friendly camaraderie between Iwata and other members of Nintendo as jokes and laughter were commonplace. They also revealed a different side of the normally secretive Nintendo: openness to discuss some of the inner workings of the company. In 2011, Iwata helped to institute Nintendo Direct, a series of online press conferences open to all that revealed upcoming Nintendo games and products outside of typical industry channels. These videos were often quirky and humourous, reflecting the personality of Iwata himself. This stood completely against the generally serious tones displayed by Sony and Microsoft. One such video displayed a mock battle between him and Nintendo of America President Reggie Fils-Aimé to showcase the inclusion of Mii characters, Nintendo digital avatars, in Super Smash Bros. for Nintendo 3DS and Wii U. These frequently spurred the creation of Internet memes; such memes include the phrase "please understand" which was often used by Iwata for delays or other negative news, adding "[Iwata laughs]" to forum posts as a reference to his frequent laughter in segments of Iwata Asks, and images of Iwata staring silently at a bunch of bananas as part of a pre-recorded E3 2012 video to promote the Donkey Kong franchise. As a byproduct of his presence in Iwata Asks and Nintendo Direct, Iwata became the public face of Nintendo. Iwata enjoyed conversing with reporters and would prepare stories in advance to entertain them. Even when time did not allow, he would mingle with interviewers and chat casually. Iwata assisted in the founding of Creatures Inc. as well as The Pokémon Company alongside Tsunekazu Ishihara. In 1998, Iwata helped his colleague and personal friend Shigesato Itoi establish Hobonichi by working as the company's IT Manager. He acquired this position after being asked by Itoi one month prior to the June 6 launch date to arrange a website and the company's technical systems, to which Iwata complied. Iwata personally enjoyed the role and even still held the position in 2007, despite running Nintendo full-time by this point. Soon after his promotion to president of Nintendo, Iwata assigned himself to a development team at HAL Laboratory working on Super Smash Bros. Melee, for the GameCube, to continue his programming passion. Stemming from his work with the Brain Age series, Iwata assisted in producing educational titles such as Kanji Sonomama Rakubiki Jiten DS, English Training: Have Fun Improving Your Skills!, and Imasara Hito ni Kikenai Otona no Joushikiryoku Training DS. He also worked on Animal Crossing, Mario, Metroid Prime, and The Legend of Zelda series of games, among other titles. He also had a cameo in WarioWare: Smooth Moves. Iwata partook in the development of Pokémon Go, an augmented reality mobile game, starting in 2013. The game was publicly revealed in September 2015, two months after his death. Fans left memorabilia and personalized artwork of various Nintendo video game series, including Mario, Kirby, and The Legend of Zelda, dedicated to Iwata at a memorial in the Nintendo World Store. On June 5, 2014, Nintendo announced that Iwata would not attend E3 2014 due to medical problems. Iwata issued a public message to shareholders on June 24 that he had undergone surgery the previous week to remove a tumor in his bile duct discovered during a routine physical examination. After roughly four months of recovery from a successful surgery, he returned to work in October. During this time he lost a notable amount of weight, but stated he was feeling healthier as a result. Iwata made his first public appearance on a Nintendo Direct announcement on November 5, but looked "gaunt and pale". He appeared to take this in stride and updated his own Mii, avatars used in Nintendo hardware, in June 2015 to reflect his slimmer self. On January 28, 2015, Iwata came down with a high fever and was suspected to have influenza; a meeting with shareholders was postponed accordingly. Some time after attending a different shareholder meeting on June 26, Iwata became ill again and was hospitalized. Despite his hospitalization, Iwata continued to work via his laptop in his bed and provided feedback on Pokémon Go to Tsunekazu Ishihara. He died due to complications from the tumor on July 11 at the age of 55. Nintendo announced his death the following day. Flags at Nintendo's headquarters were lowered to half-staff on July 13. Nintendo's regional offices took a day of silence on July 13 across all of its social media accounts in remembrance of Iwata. Members of the gaming industry and fans alike expressed their sadness on social media over Iwata's death and gratitude for his accomplishments. 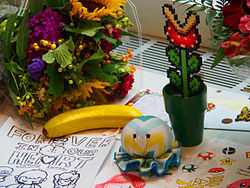 Fans established memorials across the world, including at the Japanese Embassy in Moscow, Russia, and the Nintendo World Store in Manhattan, New York. Shuhei Yoshida, president of SCE Worldwide Studios, stated: "I pray that Mr. Iwata, who contributed so much to the development of the gaming industry, rests in peace." Composer and director Junichi Masuda, most known for his work with the Pokémon games, tweeted: "He was a man who understood Pokémon, and a great leader. When I visited the other day, he was well. I will pray for his soul from the bottom of my heart." The Tokyo Institute of Technology issued a memorial statement on August 4, with Iwata's former classmates and professors contributing their memories. At The Game Awards 2015, Reggie Fils-Aimé delivered a tribute to Iwata, describing him as "fearless" and "unique, in the fullest meaning of the word". Several hours after the announcement of Iwata's death, a photograph of a rainbow over Nintendo's headquarters in Kyoto was posted to Twitter and widely shared; it was dubbed "the Rainbow Road to heaven", in reference to a stage in the Mario Kart series. Funeral services for Iwata were held in Kyoto on July 16 and 17. Despite stormy weather produced by Typhoon Nangka, an estimated 4,100 people attended to pay their respects. Following the wake, Iwata's remains were cremated and his ashes were buried at an undisclosed place in Kyoto. Following Iwata's death, general directors Shigeru Miyamoto and Genyo Takeda temporarily managed the company together. On September 14, Nintendo announced that Tatsumi Kimishima, head of its Human Resources Division and former president of Nintendo of America, would succeed Iwata as the fifth president of Nintendo. On my business card, I am a corporate president. In my mind, I am a game developer. But in my heart, I am a gamer. Throughout his life, Iwata was known for unconventional ideas and changing the medium of gaming. He was seen as the embodiment of Nintendo: playful, quirky, humourous, and fun. Iwata's proficiency in programming led many to refer to him as a "genius" in the subject, with some likening him to a Japanese Bill Gates. His hands-on approach to business earned him admiration and respect from both developers and gamers. The opening to Iwata's "Heart of a Gamer" speech at GDC 2005 is regarded as the "essence" of who he was: a humble businessman dedicated to video games. He, alongside others at Nintendo such as Miyamoto, are credited with vastly expanding the gaming market and creating a new genre. By targeting a new audience instead of competing against Microsoft and Sony, Iwata avoided a "straight fight" with Nintendo's competitors and successfully achieved his goals. Accordingly, Iwata was referred to as a "gentle revolutionary". The simplistic appeal of the Nintendo DS and Wii served to expand the market. Chris Kohler of Wired magazine stated that "thanks to Nintendo's Satoru Iwata, we're all gamers now," referring to the surge in video game popularity following the releases of the Nintendo DS and Wii. Although widely respected, he received criticism over his stubbornness in moving Nintendo to the mobile market. Following Iwata's death, Reggie Fils-Aimé remarked, "... it will be years before his impact on both Nintendo and the full video game industry will be fully appreciated." In October 2015, a fan-made Amiibo featuring Iwata's Mii avatar was crafted and auctioned for US$1,900 on eBay; all proceeds were to be donated to the Child's Play charity in his memory. Iwata was posthumously and unanimously granted the Lifetime Achievement Award at the 2015 Golden Joystick Awards for his influence across the gaming industry. Iwata was also posthumously granted the Lifetime Achievement Award at the 2016 DICE Awards. At the 2016 Game Developers Choice Awards, Iwata was honored with a short animated film by David Hellman, the artist who worked on Braid. A tribute in honor of Iwata, reading "This game is dedicated to our wingman who fell in battle", was placed at the end of the credits for Star Fox Zero. Another speculated tribute appears in the Nintendo Switch 2017 launch title The Legend of Zelda: Breath of the Wild, a game in development at the time of his death. A non-playable character, who bears a striking resemblance to Satoru Iwata, asks for the player to go atop Satori Mountain in search of the mystical Lord of the Mountain. Given the similarity between "Satori" and "Satoru" and the fact that the Lord of the Mountain is seen as a guiding spirit, the quest is thought to be an elaborate tribute to Iwata. In September 2017, modders discovered that an emulated version of the NES game Golf, which Iwata programmed, is included in every Nintendo Switch console's firmware, and can be accessed by moving the Joy-Con controllers similarly to how Iwata would move his hands in Nintendo Direct presentations when the system clock is set to July 11, the day of his death; this appeared to be removed by Nintendo with a system update issued later that year. Within Pokémon Ultra Sun and Ultra Moon, visiting the Game Freak building with Pokémon transferred from Pokémon Gold and Silver has a non-player character relate how they were having trouble getting data onto the Game Boy Color game cards until they were helped by an "amazing guy"; this acknowledges Iwata's contribution to Gold and Silver that allowed them to include the whole of the world from Pokémon Red and Blue without compromising the size of the Gold/Silver world. Within The Binding of Isaac: Rebirth, a daily challenge that occurs on each December 6 (Iwata's birthday) uses a unique avatar based on Iwata. ^ All totals are in JPY values of their respective years. ^ a b Boxer, Steve (July 14, 2015). "Satoru Iwata obituary". The Guardian. Guardian Media Group. Archived from the original on July 15, 2015. Retrieved July 14, 2015. ^ a b c Martens, Todd (July 12, 2015). "Nintendo's Satoru Iwata dies at 55; under him, Wii created hordes of new gamers". Los Angeles Times. Tribune Publishing. Archived from the original on July 14, 2015. Retrieved July 12, 2015. ^ a b c Inoue 2009, p. 56. ^ Kasai 1994, chpt. 4. ^ a b c d e Inoue 2009, p. 57. ^ a b Takenaka, Kiyoshi (December 9, 2008). "Satoru Iwata – the man behind Nintendo's casual gaming boom". news.com.au. News Limited. Archived from the original on October 7, 2013. Retrieved March 27, 2012. ^ a b c d e f g Stanton, Rich; Stuart, Keith (July 13, 2015). "Satoru Iwata changed the whole games industry and now leaves it in mourning". The Guardian. Guardian Media Group. Retrieved July 26, 2015. ^ a b c d e Andersen, John (October 9, 2015). "A former mentor recalls the early career of Satoru Iwata". Gamasutra. UBM plc. Archived from the original on October 11, 2015. Retrieved October 11, 2015. ^ a b c Wong, Tessa; Chen, Heather (July 13, 2015). "Satoru Iwata: Nintendo's gamer CEO". BBC. Retrieved July 31, 2015. ^ a b c d e "岩田聡氏を悼んで" [Mourning Mr. Satoru Iwata] (in Japanese). Tokyo Institute of Technology. August 4, 2015. Retrieved October 8, 2015. ^ Bagnall 2011, chpt. 15. ^ Hasegawa 2010, p. 45. ^ a b c d e f g h i j k l m n o p Robinson, Martin (July 13, 2015). "Satoru Iwata: a gentle revolutionary". Eurogamer. Gamer Network. Retrieved July 17, 2015. ^ a b c Szczepaniak, John. "Before They Were Famous". Retro Gamer. No. 35. Imagine Publishing. p. 76. ^ a b c d Inoue 2009, p. 58. ^ a b c d e Burns, James (July 16, 2004). "Profile: Satoru Iwata". IGN. Ziff Davis. p. 1. Retrieved July 19, 2015. ^ a b c "Satoru Iwata – 1999 Developer Interview". Used Games. 1999. Retrieved July 13, 2016. ^ Nakago, Toshihiko; Tezuka, Takashi (November 13, 2009). "New Super Mario Bros.: Volume 2" (Interview). Iwata Asks. Interviewed by Satoru Iwata. Nintendo. Retrieved November 22, 2013. ^ Iwata, Satoru (October 5, 2006). "Special Edition Interview: Turning the Tables: Asking Iwata" (Interview). Iwata Asks. Interviewed by Yasuhiro Nagata. Nintendo. Retrieved November 22, 2013. ^ Hasegawa 2010, pp. 45–46. ^ Inoue 2009, p. 61. ^ Nakamura, Toshi (July 22, 2015). "Smash Bros. Creator Remembers Satoru Iwata". Kotaku. Gawker Media. Retrieved July 26, 2015. ^ a b Morimoto, Shigeki; Ishihara, Tsunekazu (September 4, 2009). "Pokémon HeartGold Version & SoulSilver Version: Just Being President Was A Waste!" (Interview). Iwata Asks. Interviewed by Satoru Iwata. Nintendo. Retrieved July 12, 2015. ^ Wawro, Alex (December 30, 2015). "Pokemon chief: Iwata was the one who brought Pokemon to the West". Gamasutra. Retrieved December 30, 2015. ^ Burns, James (July 16, 2004). "Profile: Satoru Iwata". IGN. Ziff Davis. p. 2. Retrieved July 19, 2015. ^ "Yamauchi Retires". IGN. Ziff Davis. May 24, 2002. Retrieved July 19, 2015. ^ Thomas, Lucas M. (May 24, 2012). "Hiroshi Yamauchi: Nintendo's Legendary President". IGN. Ziff Davis. Retrieved July 19, 2015. ^ a b Kageyama, Yuri (July 12, 2015). "Nintendo President Satoru Iwata Dies of Tumor". Associated Press. Archived from the original on August 1, 2015. Retrieved July 12, 2015. ^ a b Stack, Liam (July 13, 2015). "Satoru Iwata, Nintendo Chief Executive, dies at 55". New York Times. The New York Times Company. Retrieved July 13, 2015. ^ a b Inoue 2009, p. 77. ^ a b c d Burns, James (July 16, 2004). "Profile: Satoru Iwata". IGN. Ziff Davis. p. 3. Retrieved July 19, 2015. ^ a b Inoue 2009, pp. 83–85. ^ Inoue 2009, pp. 87–88. ^ 2003 Annual Report (PDF) (Report). Nintendo. 2003. p. 72. Retrieved September 14, 2015. ^ a b Annual Report 2014 for the fiscal year ended March 31, 2014 (PDF) (Report). Nintendo. 2014. p. 1. Retrieved September 3, 2015. ^ a b Inoue 2009, pp. 27–31. ^ Inoue 2009, pp. 26–27. ^ Inoue 2009, p. 81. ^ a b "Nintendo DS going wireless?". GameSpot. CBS Interactive. March 1, 2004. Archived from the original on July 27, 2015. Retrieved July 27, 2015. ^ a b c d Reimer, Jeremy (March 28, 2007). "Nintendo boss levels up to "top 30 CEO"". Ars Technica. Condé Nast. Archived from the original on December 1, 2012. Retrieved July 12, 2015. ^ Inoue 2009, p. 34. ^ Inoue 2009, p. 35. ^ a b "Consolidated Sales Transition by Region" (PDF). Nintendo. October 29, 2014. Retrieved July 26, 2015. ^ Schreier, John (January 4, 2011). "Nintendo DS Line Outsells Playstation 2, Nintendo Says". Wired. Condé Nast. Retrieved July 26, 2015. ^ a b Inoue 2009, pp. 17–18. ^ Inoue 2009, p. 80. ^ Inoue 2009, p. 16. ^ a b Iwata, Satoru (October 31, 2008). "Corporate Management Policy Briefing/Semi-Annual Financial Results Briefing". Nintendo. p. 6. Retrieved September 3, 2015. ^ a b c Metzger, Pete (April 5, 2009). "Review: Nintendo DSi offers evolutionary, not revolutionary, upgrade over DS Lite". The Los Angeles Times. Tribune Publishing. Retrieved September 11, 2015. ^ Rojas, Peter (February 20, 2006). "The Engadget Interview: Reggie Fils-Aime, Executive Vice President of Sales and Marketing for Nintendo". Engadget. AOL. Retrieved September 11, 2015. ^ a b c Iwata, Satoru (November 17, 2010). "Nintendo DSi: Turning the Tables: Asking Iwata" (Interview). Iwata Asks. Interviewed by Yasuhiro Nagata. Nintendo. Retrieved September 3, 2015. ^ Nelson, Randy (January 9, 2009). "Iwata still sees vast market for current DS hardware". Engadget. AOL. Retrieved September 11, 2015. ^ Martin, Matt (January 9, 2009). "More room for DS growth, says Iwata". GamesIndustry.biz. Gamer Network. Retrieved September 11, 2015. ^ a b Kamen, Matt (July 13, 2015). "Satoru Iwata: Nintendo's late legend, in his own words". Wired. Condé Nast. Retrieved September 2, 2015. ^ a b Inoue 2009, p. 37. ^ a b Hasegawa 2010, pp. 50–51. ^ Inoue 2009, p. 38. ^ a b Jones & Thiruvathukal 2012, p. 28. ^ Inoue 2009, pp. 40–41. ^ Inoue 2009, pp. 43–45. ^ a b Jones & Thiruvathukal 2012, p. 53. ^ Jones & Thiruvathukal 2012, p. 54. ^ Jones & Thiruvathukal 2012, p. 2. ^ a b Hasegawa 2010, p. 51. ^ a b Kohler, Chris (July 12, 2015). "Nintendo President Satoru Iwata Dies at 55". Wired. Condé Nast. Retrieved July 12, 2015. ^ a b c d Peckman, Matt (July 13, 2015). "Why Nintendo President Satoru Iwata Mattered". Time. Time Inc. Retrieved July 13, 2015. ^ a b c 2009 Annual Financial Report: Financial Section (PDF) (Report). Nintendo. 2009. p. 17. Retrieved September 3, 2015. ^ a b c d Morris, Chris (August 19, 2015). "Is Nintendo backing away from its Quality of Life initiative?". Fortune. Time Inc. Retrieved September 9, 2015. ^ Miyamoto, Shigeru (November 8, 2007). "Wii Fit: A New Creation" (Interview). Iwata Asks. Interviewed by Satoru Iwata. Nintendo. Retrieved September 9, 2015. ^ Pearson, Dan (June 2, 2009). "E3: Iwata shows Wii Vitality Sensor". Eurogamer. Gamer Network. Retrieved September 8, 2015. ^ a b c "The 73rd Annual General Meeting of Shareholders: Q&A". Nintendo. 2013. p. 3. Retrieved September 8, 2015. ^ Takahashi, Dean (June 4, 2009). "Nintendo CEO: Wii care about your heartbeat, but not your iPhone, the recession or free games". VentureBeat. Retrieved September 8, 2015. ^ Haywald, Justin (January 29, 2014). "Mario Kart 8 coming in May and Nintendo reveals 2014 strategy". GameSpot. CBS Interactive. Retrieved September 9, 2015. ^ Iwata, Satoru (2014). "Message from the President". Nintendo. Archived from the original on September 10, 2015. Retrieved September 9, 2015. ^ Crossley, Rob (October 30, 2014). "Nintendo Reveals First Quality-of-Life Product: A Sleep Sensor". GameSpot. CBS Interactive. Retrieved September 9, 2015. ^ Kohler, Chris (February 4, 2016). "Nintendo Puts Its Sleep-Tracking Gizmo on Hold Indefinitely". Wired. Condé Nast. Retrieved February 4, 2016. ^ 2006 Annual Financial Report (PDF) (Report). Nintendo. 2006. p. 15. Retrieved September 3, 2015. ^ 2007 Annual Financial Report: Consolidated Financial Statements (PDF) (Report). Nintendo. April 26, 2007. p. 1. Retrieved September 3, 2015. ^ 2008 Annual Financial Report: Financial Section (PDF) (Report). Nintendo. 2008. p. 15. Retrieved September 3, 2015. ^ 2010 Annual Financial Report: Financial Section (PDF) (Report). Nintendo. 2010. p. 17. Retrieved September 2, 2015. ^ 2011 Annual Financial Report: Financial Section (PDF) (Report). Nintendo. 2011. p. 17. Retrieved September 3, 2015. ^ a b Financial Results Briefing for the Nine-Month Period Ended December 2011 (PDF) (Report). Nintendo. January 27, 2012. p. 1. Retrieved September 2, 2015. ^ 2013 Annual Financial Report (PDF) (Report). Nintendo. 2011. p. 21. Retrieved September 3, 2015. ^ a b c d Annual Report 2015 for the fiscal year ended March 31, 2015 (PDF) (Report). Nintendo. 2015. p. 1. Retrieved September 2, 2015. ^ a b c Luckerson, Victor (May 7, 2015). "Why Nintendo is Suddenly Profitable Again". Time. Time Inc. Retrieved July 21, 2015. ^ a b Peckham, Matt (March 18, 2015). "Exclusive: Inside Nintendo's Bold Plan to Stay Vibrant for the Next 125 Years". Time. Time Inc. Retrieved July 21, 2015. ^ Osawa, Juro (January 10, 2011). "Nintendo's chief defends 3DS". Wall Street Journal. Dow Jones & Company. Retrieved September 3, 2015. ^ Sawa, Kazuyo (July 29, 2011). "Nintendo stock rout costs Yamauchi $300 million in one day". Bloomberg L.P. Bloomberg News. Retrieved September 2, 2015. ^ Olivarez-Giles, Nathan (July 28, 2011). "Nintendo 3DS price dropping to $170". Los Angeles Times. Tribune Publishing. Retrieved September 3, 2015. ^ "Nintendo suffers ahead of Wii U launch". The Telegraph. Telegraph Media Group. October 24, 2012. Retrieved September 3, 2015. ^ a b Negishi, Mayumi; Kachi, Hiroyuki; Sherr, Ian (January 17, 2014). "Nintendo sees loss on dismal Wii U sales". Wall Street Journal. Dow Jones & Company. Retrieved September 3, 2015. ^ a b Amano, Takashi; Yasu, Mariko (January 21, 2014). "Nintendo's Iwata under dire after missing Wii U forecast". Bloomberg L.P. Bloomberg News. Retrieved September 3, 2015. ^ Ewalt, David M. (September 13, 2012). "Nintendo Reveals Wii U Launch Date, Price, Details". Forbes. Forbes Inc. Retrieved September 3, 2015. ^ Orland, Kyle (October 25, 2012). "Why Nintendo is losing money on each Wii U launch unit". Ars Technica. Condé Nast. Retrieved September 3, 2015. ^ Sinclair, Brendan (July 5, 2013). "Miyamoto: We underestimated cost of HD development". GamesIndustry.biz. Gamer Network. Retrieved September 8, 2015. ^ Handrahan, Matthew (June 17, 2013). "Iwata: "We don't care about what other companies are doing"". GamesIndustry.biz. Gamer Network. Retrieved September 8, 2015. ^ Tassi, Paul (July 8, 2013). "Miyamoto Admits Nintendo Underestimated the Switch to HD". Forbes. Forbes Inc. Retrieved September 8, 2015. ^ Morris, Chris (June 23, 2015). "Shigeru Miyamoto: Why the Wii U crashed and burned". Fortune. Time Inc. Retrieved September 3, 2015. ^ Makuch, Eddie (October 31, 2013). "Nintendo: We have failed to establish Wii U as a "worthy" Wii successor". GameSpot. CBS Interactive. Retrieved September 3, 2015. ^ Jenkins, David (June 29, 2010). "Nintendo boss earns $770,000 basic salary". GamesIndustry.biz. Gamer Network. Retrieved July 19, 2015. ^ Pereira, Chris (July 29, 2011). "Iwata's Salary Cut in Half, 3DS Price Drop Explained". 1UP.com. IGN. Archived from the original on July 20, 2015. Retrieved July 19, 2015. ^ Gaston, Martin (January 29, 2014). "Nintendo CEO slashes salary in half to apologise for Wii U losses". GameSpot. CBS Interactive. Retrieved July 19, 2015. ^ Kain, Erik (May 2, 2012). "Nintendo Reports First Annual Loss in Three Decades, Over $500 Million in the Red". Forbes. Forbes Inc. Retrieved September 3, 2015. ^ "Nintendo posts first loss in 30 years". The Guardian. Guardian Media Group. Associated Press. April 26, 2012. Retrieved September 3, 2015. ^ Martin, Matt (April 24, 2013). "Iwata becomes CEO of Nintendo of America". GamesIndustry.biz. Gamer Network. Retrieved July 12, 2015. ^ a b "Notification of Death and Personnel Change of a Representative Director (President)" (PDF) (Press release). Nintendo. July 12, 2015. Archived (PDF) from the original on July 13, 2015. Retrieved July 13, 2015. ^ Goldfarb, Andrew (April 23, 2013). "No Nintendo Press Conference at E3 2013". IGN. Ziff Davis. Archived from the original on June 11, 2015. Retrieved July 12, 2015. ^ "Financial Results Briefing for Fiscal Year Ended March 2016". Nintendo. April 28, 2016. p. 3. Retrieved May 1, 2016. ^ Rawson, Chris (March 4, 2010). "Nintendo not concerned about competition from Apple". Engadget. AOL. Retrieved September 3, 2015. ^ Bosker, Bianca (July 7, 2010). "Satoru Iwata, Nintendo CEO: Apple is the 'enemy of the future'". The Huffington Post. AOL. Retrieved September 3, 2010. ^ Thomas, Lucas M. (September 13, 2011). "Nintendo + Smartphones? Iwata Says "Absolutely Not"". IGN. Ziff Davis. Retrieved September 3, 2015. ^ a b Gilbert, Ben (March 17, 2015). "The history behind Nintendo's flip-flop on mobile gaming". Engadget. AOL. Retrieved September 3, 2015. ^ Totilo, Stephen (August 21, 2012). "Unintimidated by Apple, Nintendo's Boss Says the World Still Needs Dedicated Gaming Handhelds". Kotaku. Gawker Media. Retrieved September 3, 2015. ^ a b "Second Quarter Financial Results Briefing for the 74th Fiscal Term Ending March 2014 – Q & A". Nintendo. 2014. Retrieved September 3, 2015. ^ a b Ozawa, Harumi (July 13, 2015). "Nintendo CEO Satoru Iwata dies of cancer at 55". Yahoo! Tech. Yahoo!. Agence France-Presse. Archived from the original on September 3, 2015. Retrieved September 2, 2015. ^ "The man who revolutionized gaming". The Japan Times. Nifco. July 21, 2015. Retrieved September 3, 2015. ^ Peckham, Matt (March 18, 2015). "Exclusive: Nintendo CEO Reveals Plans for Smartphones". Time. Time Inc. Retrieved July 13, 2015. ^ Makuch, Eddie (October 30, 2013). "Nintendo explains why Mario is not on smartphones". GameSpot. CBS Interactive. Retrieved July 21, 2015. ^ Makuch, Eddie (March 18, 2015). "Players More Important Than Money, Nintendo Pres. Says About Smartphone Deal". GameSpot. CBS Interactive. Retrieved July 21, 2015. ^ Peckham, Matt (March 23, 2015). "8 More Fascinating Things Nintendo CEO Satoru Iwata Told Time". Time. Time Inc. Retrieved September 20, 2015. ^ Yuji Nakamura (February 2, 2017). "Nintendo Plays With Fire". Bloomberg Business. Retrieved February 5, 2017. ^ Ashcraft, Brian (February 15, 2017). "Satoru Iwata Put Lots Of Thought Into The Nintendo Switch, Says Miyamoto". Kotaku. Gawker Media. Retrieved March 18, 2017. ^ a b Ashcraft, Brian (June 6, 2012). "Nintendo Proves There's Nothing as Bananas as Holding ... Bananas". Kotaku. Gawker Media. Retrieved July 19, 2015. ^ Hasegawa 2010, p. 46. ^ "社長が訊く リンク集" (in Japanese). Nintendo. 2015. Retrieved July 22, 2015. ^ Iwata, Satoru (2011). "Nintendo 3DS Third Party Game Developers". Iwata Asks. Nintendo. Retrieved July 21, 2015. ^ Leong, Bernard (August 15, 2015). "Analyse Asia 50: A tribute to Satoru Iwata & Nintendo's future with Serkan Toto". Tech In Asia. Retrieved August 25, 2015. ^ a b Walton, Mark (July 13, 2015). "Without Iwata, what does the future hold for Nintendo?". Ars Technica. Condé Nast. Retrieved July 31, 2015. ^ Corriea, Alexa Ray (June 10, 2014). "You can import your Mii to fight in the next Super Smash Bros". Polygon. Vox Media. Retrieved July 19, 2015. ^ Ap, Tiffany (July 13, 2015). "Fans mourn death of Nintendo President Satoru Iwata". CNN. Turner Broadcasting System. Retrieved July 19, 2015. ^ "Nintendo's Satoru Iwata: Gamers pay tribute". BBC. July 13, 2015. Retrieved September 1, 2015. ^ Chikushi, Yuji (2015). "Iwata-san, What is Your Favorite Game? A reporter's reflection of the late Nintendo CEO's personality". Toyo Keizai Online. Toyo Keizai. Archived from the original on August 16, 2015. Retrieved August 15, 2015. ^ Morimoto, Shigeki; Ishihara, Tsunekazu (September 4, 2009). "Pokémon HeartGold Version & SoulSilver Version: Just Making the Last Train" (Interview). Iwata Asks. Interviewed by Satoru Iwata. Nintendo. Retrieved July 12, 2015. ^ "Iwata Asks". Retrieved December 11, 2016. ^ Iwata, Satoru (September 10, 2007). "Reminiscence of the IT Manager". 1101.com (Interview) (in English and Japanese). Interviewed by Shigesato Itoi. Hobo Nikkan Itoi Shinbun. p. 11. Retrieved July 16, 2015. ^ a b Casamassina, Matt (March 10, 2005). "GDC 2005: Iwata Keynote Transcript". IGN. Ziff Davis. Retrieved August 15, 2015. Staff (July 13, 2015). "Video: Satoru Iwata's 'Heart Of A Gamer' keynote at GDC 2005". Gamasutra. UBM plc. Retrieved July 13, 2016. ^ Inoue 2009, pp. 79–80. ^ a b Kreps, Daniel (July 13, 2015). "Satoru Iwata, President and CEO of Nintendo, Dead at 55". Rolling Stone. Wenner Media. Retrieved July 13, 2015. ^ Parkin, Simon (July 13, 2015). "Postscript: Satoru Iwata (1959–2015)". The New Yorker. Condé Nast. Retrieved July 13, 2015. ^ Morris, Chris (September 11, 2015). "Pokémon leads Nintendo's mobile charge". NBC News. Retrieved September 11, 2015. ^ Kurtenbach, Elaine (September 11, 2015). "Pokemon Go for iOS, Android devices will allow players to bring 'pocket monsters' into the real world". Financial Post. Postmedia Network. Associated Press. Retrieved September 11, 2015. ^ Makuch, Eddie (June 5, 2014). "Nintendo President Not Coming to E3 on Doctor's Advice". GameSpot. CBS Interactive. Retrieved July 18, 2015. ^ Iwata, Satoru (June 24, 2014). To our shareholders. The 74th Annual General Meeting of Shareholders (Memo). Nintendo. Retrieved July 18, 2015. ^ Martin, Liam (October 29, 2014). "Nintendo President Satoru Iwata returns to work after surgery". Digital Spy. Hearst Corporation. Retrieved July 18, 2015. ^ Crossley, Rob (November 6, 2014). "Nintendo's Iwata Addresses Concerns Over Rapid Weight Loss". GameSpot. CBS Interactive. Retrieved July 18, 2015. ^ Iwata, Satoru [@Nintendo] (June 12, 2015). "[岩田]私は、昨年６月に病気で手術をした影響で少しスリムになりました。退院後、体重はほとんど変わっておらず、この体型が維持できそうですので、公式Miiを現状に合わせることにしました。よろしくお願いします。#Iwatter" (Tweet) (in Japanese). Retrieved July 18, 2015 – via Twitter. ^ Iwata, Satoru [@Nintendo] (January 28, 2015). "[岩田] 本日、アナリストおよび投資家様を対象とした第3四半期決算説明会の開催を予定しておりましたが、昨夜より発熱がありインフルエンザの疑いがあるため、大変申し訳ございませんが開催を延期させていただくことにいたしました。変更後の日程は改めてお知らせさせていただきます。" (Tweet) (in Japanese). Retrieved July 18, 2015 – via Twitter. ^ McWhertor, Michael (July 17, 2015). "Nintendo releases Genyo Takeda's memorial address for Satoru Iwata". Polygon. Vox Media. Retrieved July 18, 2015. ^ a b McFerran, Damien (August 15, 2016). "Satoru Iwata Offered Pokémon GO Feedback From His Hospital Bed". Nintendo Life. Retrieved February 2, 2017. ^ a b Plunkett, Luke (July 12, 2015). "The Video Game Community Pays Tribute to Satoru Iwata". Kotaku. Gawker Media. Retrieved July 12, 2015. ^ Mueller, Saira (July 13, 2015). "Gaming industry pays tribute to Nintendo CEO Satoru Iwata, dead at 55". International Business Times. IBT Media. Retrieved July 13, 2015. ^ Bowman, John (July 13, 2015). "Nintendo fans pay tribute to Satoru Iwata". Canadian Broadcasting Corporation. Retrieved July 13, 2015. ^ Ashcraft, Brian (July 15, 2015). "Russian Nintendo Fans Honor Satoru Iwata at the Japanese Embassy". Kotaku. Gawker Media. Retrieved July 19, 2015. ^ Totilo, Stephen (July 16, 2015). "Satoru Iwata Memorial at the Nintendo World Store in NYC". Kotaku. Gawker Media. Retrieved July 19, 2015. ^ Yoshida, Shuhei [@yosp] (July 12, 2015). "ゲーム業界の発展に多大な貢献をされた岩田さんのご冥福をお祈りします。" (Tweet) (in Japanese) – via Twitter. ^ Masuda, Junichi [@Junichi_Masuda] (July 12, 2015). "任天堂の岩田社長が逝去されました。ポケモンの理解者であり、素晴らしいリーダーでした。先日お会いした時はお元気だったのに。。心よりご冥福をお祈り致します" (Tweet) (in Japanese) – via Twitter. ^ Farokhmanesh, Megan (December 3, 2015). "Watch The Game Awards pay tribute to Satoru Iwata". Polygon. Vox Media. Retrieved December 9, 2015. ^ Philips, Tom (December 4, 2015). "Reggie Fils-Aime pays tribute to late Nintendo president Satoru Iwata". Eurogamer. Gamer Network. Retrieved December 9, 2015. ^ Sola, Katie (July 13, 2015). "As the world mourns CEO Iwata's passing, a rainbow rises over Nintendo headquarters". The Huffington Post. AOL. Retrieved July 14, 2015. ^ Molloy, Mark (July 13, 2015). "Satoru Iwata: Rainbow 'road' appears above Nintendo HQ after CEO's death". The Telegraph. Telegraph Media Group. Retrieved July 14, 2015. ^ Mochizuki, Takashi (July 17, 2015). "Fans remember Nintendo President Iwata at funeral". Wall Street Journal. Dow Jones & Company. Retrieved July 17, 2015. ^ Schreier, Jason (July 17, 2015). "Thousands Attend Two-Day Funeral for Satoru Iwata". Kotaku. Gawker Media. Retrieved July 17, 2015. ^ Crecente, Brian (July 17, 2015). "Thousands attend Iwata's funeral in Kyoto". Polygon. Vox Media. Retrieved July 17, 2015. ^ Nakamura, Toshi (July 30, 2015). "Smash Bros. Creator Talks of Satoru Iwata's Funeral". Kotaku. Gawker Media. Retrieved July 31, 2015. ^ Riley, Charles (July 12, 2015). "Nintendo President Satoru Iwata dies at 55". CNNMoney. Time Warner. Retrieved July 15, 2015. ^ "Notice Regarding Personnel Change of a Representative Director and Role Changes of Directors" (PDF) (Press release). Nintendo. September 14, 2015. Archived from the original (PDF) on September 14, 2015. Retrieved September 14, 2015. ^ a b Hiranand, Ravi (July 13, 2015). "Nintendo's CEO Satoru Iwata played by his own rules". CNN. Turner Broadcasting System. Retrieved September 2, 2015. ^ Rundle, Michael (July 13, 2015). "Nintendo President Satoru Iwata dies at 55". Wired. Condé Nast. Retrieved September 2, 2015. ^ Tane, Kiyoshi (August 8, 2015). "追悼・岩田聡氏。ゲームで辿る天才プログラマの軌跡 (1. 初期ファミコン編)". Engadget Japan (in Japanese). AOL. Retrieved October 8, 2015. ^ Kohler, Chris (July 16, 2015). "Thanks to Nintendo's Satoru Iwata, We're All Gamers Now". Wired. Condé Nast. Retrieved July 31, 2015. ^ Molina, Bret (July 13, 2015). "Nintendo CEO Satoru Iwata dies at 55". USA Today. Gannett Company. Retrieved September 2, 2015. ^ Hussein, Tamoor (October 5, 2015). "One-of-a-Kind Satoru Iwata Memorial Amiibo on Sale to Raise Money for Charity". GameSpot. CBS Interactive. Retrieved October 8, 2015. ^ Skipper, Ben (October 9, 2015). "Nintendo: Satoru Iwata Amiibo figure raises $1,900 for charity on eBay". International Business Times. IBT Media. Retrieved October 9, 2015. ^ Sheridan, Connor (October 30, 2015). "Satoru Iwata receives the Lifetime Achievement Award at the Golden Joysticks". GamesRadar. Future plc. Retrieved October 30, 2015. ^ Philips, Tom (January 13, 2016). "Satoru Iwata to be honoured with posthumous DICE Lifetime Achievement Award". Eurogamer. Retrieved January 13, 2016. ^ Campbell, Colin (February 18, 2016). "DICE honors Satoru Iwata with Lifetime Achievement Award". Polygon. Vox Media. Archived from the original on February 19, 2016. Retrieved February 19, 2016. ^ McCormick, Rich (March 17, 2016). "Watch a touching tribute to deceased Nintendo CEO Satoru Iwata". The Verge. Retrieved March 17, 2016. ^ Rowen, Nic (April 11, 2016). "A touching Iwata tribute is in Star Fox Zero". Destructoid. Retrieved April 11, 2016. ^ Sheridan, Connor (April 11, 2016). "Watch Star Fox Zero's lovely tribute to Satoru Iwata". GamesRadar. Future plc. Retrieved April 11, 2016. ^ Kuchera, Ben (March 15, 2017). "Zelda: Breath of the Wild's alleged Iwata tribute is beautiful". Polygon. Vox Media. Retrieved March 18, 2017. ^ Dayus, Oscar (March 13, 2017). "Zelda: Breath Of The Wild Easter Egg May Pay Tribute To Late Nintendo President Saturo Iwata". GameSpot. CBS. Retrieved March 18, 2017. ^ Saed, Sherif (September 20, 2017). "The Golf game on every Nintendo Switch is actually a tribute to late Satoru Iwata". VG247. Retrieved September 20, 2017. ^ Frank, Allegra (December 27, 2017). "Switch's hidden Iwata tribute removed in latest update". Polygon. Retrieved December 27, 2017. ^ Moyse, Chris (November 23, 2017). "Pokemon Ultra Sun & Moon features a nice salute to Satoru Iwata". Destructoid. Retrieved November 23, 2017. ^ O'Conner, Alice (December 7, 2018). "The Binding Of Isaac's tribute to Satoru Iwata is sweet, for Isaac". Rock Paper Shotugun. Retrieved December 7, 2018. Bagnall, Brian (2011). Commodore: A Company on the Edge (2nd ed.). Winnipeg, Canada: Variant Press (published February 1, 2012). ISBN 978-0-9738649-6-0. Hasegawa, Yozo (2010). Rediscovering Japanese Business Leadership: 15 Japanese Managers and the Companies They're Leading to New Growth. Translated by Anthony Kimm. Singapore: Wiley (published August 24, 2011). ISBN 978-0-470-82495-5. Inoue, Osamu (2009). Nintendo Magic: Winning the Video Game Wars. Translated by Paul Tuttle Starr. Tokyo, Japan: Vertical (published April 27, 2010). ISBN 978-1-934287-22-4. Jones, Steven E.; Thiruvathukal, George K. (February 24, 2012). Codename Revolution: The Nintendo Wii Platform. Platform Studies. Cambridge, Massachusetts: Massachusetts Institute of Technology. ISBN 978-0-262-01680-3. Kasai, Omasu (January 1994). Gēmudezainā nyūmon ゲームデザイナー入門 [Introduction to Game Design] (in Japanese). Tokyo, Japan: Shogakukan. ISBN 978-4-09-220205-4. "A+E Interactive E3 2007 Interview". Archived from the original on October 16, 2007. Retrieved July 14, 2007. "Newsweek Level Up E3 2007 Interview". Archived from the original on October 11, 2008. Retrieved September 5, 2007. Atari Games Corp. v. Nintendo of America Inc.
Lewis Galoob Toys, Inc. v. Nintendo of America, Inc.
Universal City Studios, Inc. v. Nintendo Co., Ltd. This page was last edited on 12 April 2019, at 09:26 (UTC).